Putting the ShrockWorks Winch Bumper on last month gave us a few options we didn't have before. 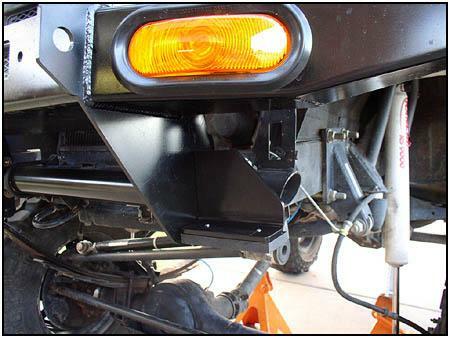 The bumper was designed to allow enough room for suspension upgrades that fit around the front of the frame rail. So we went ahead and installed the Trail Tough Front YJ Spring Kit (with Missing Link) conversion on the front of the Samurai. 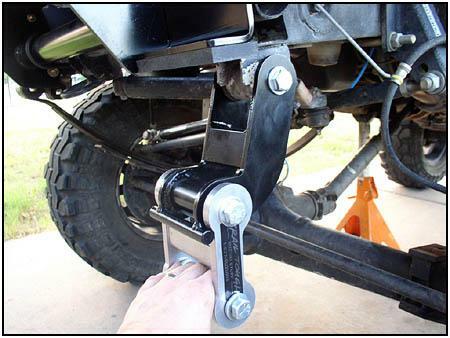 The Trail Tough 'J' shackles use a bump stop that bolts over the end of the frame rail, and when used with the new bumper it looks like it was made to be there. 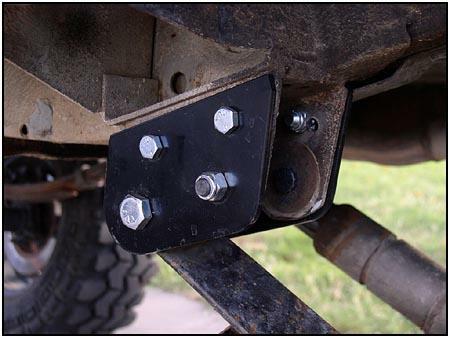 Although the bump stop pads are replaceable by just removing two screws, Trail Tough reports that they have never had to replace a set. 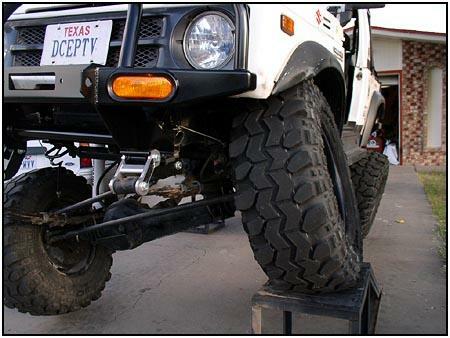 But if you ever need them, Trail Tough has them in stock and you can purchase replacements with a quick call to Brent. 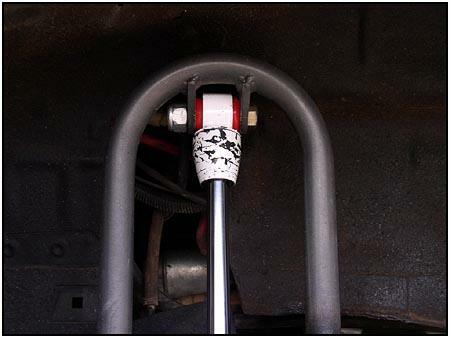 Unlike other drop shackle variants on the market, the 'J' shackle curves up around the bump stop. This allows for a shorter ride height on the street without compromising any articulation for an additional six inches of droop. 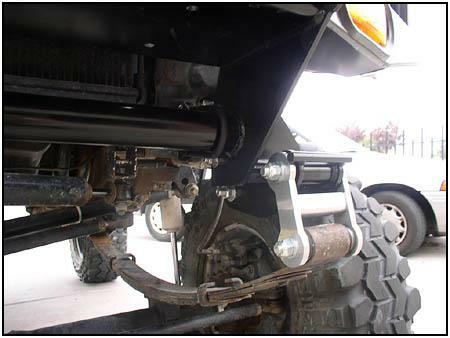 The rear brackets allow for the longer YJ spring by moving the mounting point back a few inches. There is some drilling involved here, but it is necessary so the support bolts can keep everything in place during more stressful articulation. The springs we used came from a Jeep YJ. 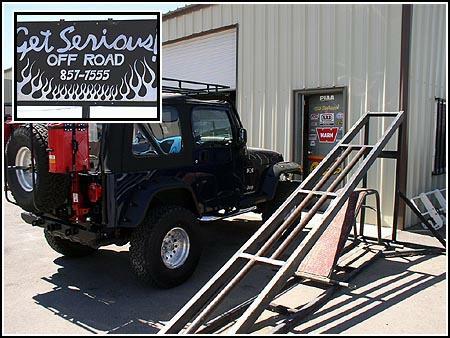 They were supplied by Get Serious Off Road* in El Paso Texas. We tried the four leaf (front) set first and found it too soft to handle the winch that will be coming next, so we used rear (five leaf) springs to do the job. 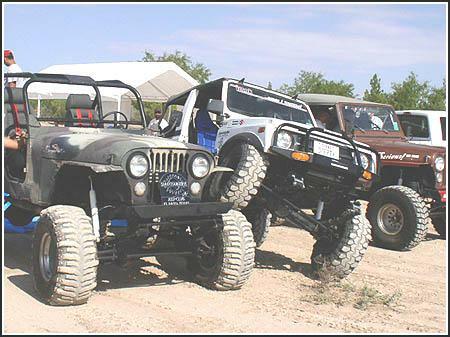 We will be looking for another set of rear springs later when we add YJs out back. 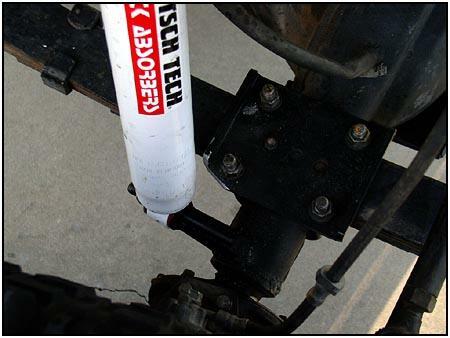 Using Doetsch Tech 8000 shocks out front took care of a few problems we had seen over the last few suspension changes. We were experimenting with a few different locations for the front axle by moving it forward a little each time. The problem was with the bump stops. We had to move them with each axle movement to keep their effectiveness. 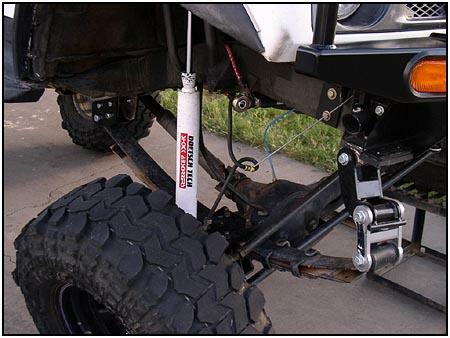 These new shocks have bump stops built in, so no more problem! On the left you can see how the bump stop keeps everything safe at full stuff. 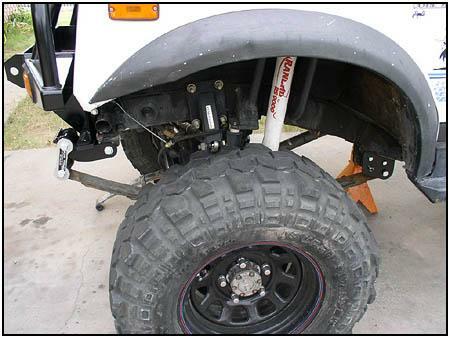 Here you can see how important measurements can be when ordering shocks. We used model 8407 (32" extended / 18.5" collapsed lengths) and it gave about an inch of clearance before it would have shredded the fender. 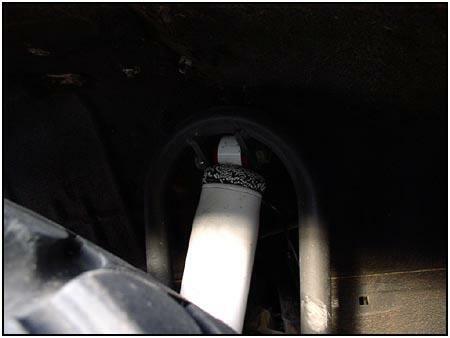 We also had to move the lower shock mount to the top of the axle because leaving it down low (previous installation) would cause the shock to try to wrap around the springs at full droop. And as you can see, this spring and shackle combination allows for LOTS of droop. You may also note the small amount of material we had to shave off the corner of the spring plate where it comes closest to the shock. We are running our upper shock mounts in a custom configuration, and it isn't in the stock location. Trail Tough assured us that is the reason the shock came close enough to the spring plate to cause concern. The good news - Trail Tough assures us that trimming the plates just a little like we did will have no ill effect on the strength of the component. Stacking our 32" tire on top of a 35" tire belonging to a fellow club member was no problem at all. 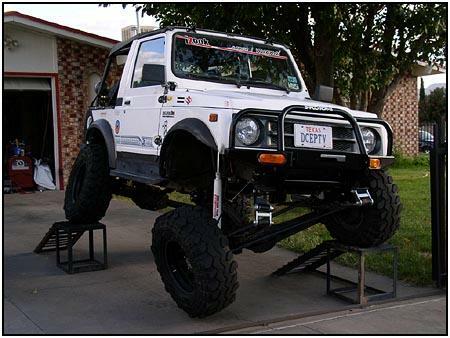 In the future we will add YJs to the rear to take the place of the CJ front springs we are using currently. This will again allow us to keep one spare spring on hand that will fit all four corners. ...Sweet. 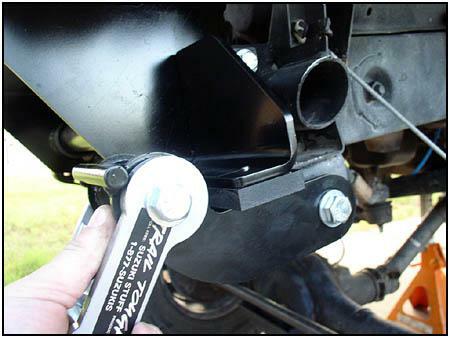 Watch for a simple winch installation with a few extra goodies for good measure! Disclaimer: The fabrication, modifications and designs you see on this web site are personal experience. If you duplicate these modifications you do so at your own risk. These articles were written over many years of that hands-on experience. The companies offering these components may no longer have them on the market. Please use these articles to keep the hobby alive. Suzuki, Samurai, Sidekick, Vitara, Grand Vitara, X-90, and the Suzuki "S" Logo are all registered trademarks of American Suzuki Motor Corporation. Geo, Chevy, and Tracker are all registered trademarks of General Motors Corporation. This site is in no way endorsed by or affiliated with the American Suzuki Motor Corporation or General Motors Corporation.